Henry Curzon, a farmer of Hill Village Road, and Edward Adcock, a yeoman of Shenstone, took on a lease from the Warden and Society of Sutton Coldfield on the eighteenth of February 1782. This was a twenty-one year lease of “the Pond or Stew at Mare Green in Sutton called Mare Pool for an annual rent of one shilling with one good dish of meat fish fit to be eaten”. 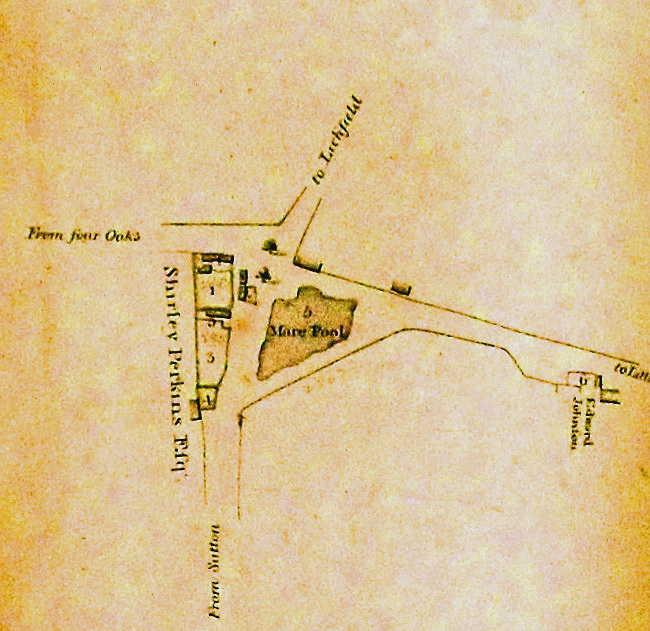 The plan shows Mere Green in 1811, a triangle of waste land bounded by fields. Hundreds of years earlier it had been larger, but strips of land to the north and south were gradually taken in and added to neighbouring farms. To the north-west was one of the old open fields of Hill Village, Mare Field - the name “Mere Green” is a corruption of Mare Green, the green next to Mare Field. To the north-east were the demesne fields of Hill village, while Ley Hill fields lay to the south. Being waste ground, there are only a few mentions of Mere Green in old documents. A 1759 lease refers to a lane “leading from the Fox and Dogs to Mare Green”, and in 1779 “Samuel Johnson of Mare Green, Blacksmith” was named as an executor of Thomas Rochford’s will. However, by the time of this plan there were a number of houses and cottages fronting on to the green. The plan is part of the Survey of Corporation Property of 1811, so the Warden and Society’s tenants are named, for example Henry Curzon for Mare Pool, measured at one rood thirty-six perches (nearly half an acre.) Nos. 1,2, and 3 on the plan are tradesmen’s houses with workshops - Widow Allport’s blacksmith’s shop, Mary Baylis’s shop, and William Taylors’ forge, while no. 6 is a garden next to Edward Johnson the carpenter’s house. Also living beside the green were a cooper, a wheelwright, a brassfounder, a stone mason and a nail maker. Some of the other six dwellings at Mere Green may have housed tradesmen, but most were labourers’ cottages. In Belwell Lane, where Waitrose is now, there was a row of six cottages on either side of the Meeting House of Hill Methodist Chapel. Radical change came in the 1820s, the pool was drained, the new school built on the green, and the new Lichfield Road was cut. Two trees are marked on the plan, at least one of which survived the 1820s - Sarah Holbeche noted in her diary a terrific storm on the first of February 1868, in which “the fine old tree at Mere Green was blown down”. The Corporation Survey is a book of forty-six accurate plans of Warden and Society properties in Sutton, made for a case being heard in the Court of Chancery in 1811. This is plan no. XLV.